Thursday's mean one thing... truffle time! Okay, Thursday's can mean a lot of things. But this particular Thursday is all about the truffles. Cashew truffles to be specific. I am a huge fan of cashews. Who isn't though?! Hm. Should we start a cashew fan club? That would be one great club. Anyways! I haven't had cashews in a long while because I was all about the Raw Till 4 life. Well now that I'm no longer about that life I'm here with some celebratory truffles! They are so rich and decadent. I think I might dream about them tonight. As always, they are so easy to make too! I made the cashew part, popped them in the freezer for a while, went and explored in the woods, and then I came back to cover them with chocolate. So easy and oh so addictive. I tried to snap pictures really quick because I wanted to eat them so bad! So you might want to make two (or three) batches of these little guys. Especially if you plan on sharing! Luckily I don't have to. Blend ingredients together until smooth. Roll out balls onto parchment paper and place into freezer for 1-2 hours. 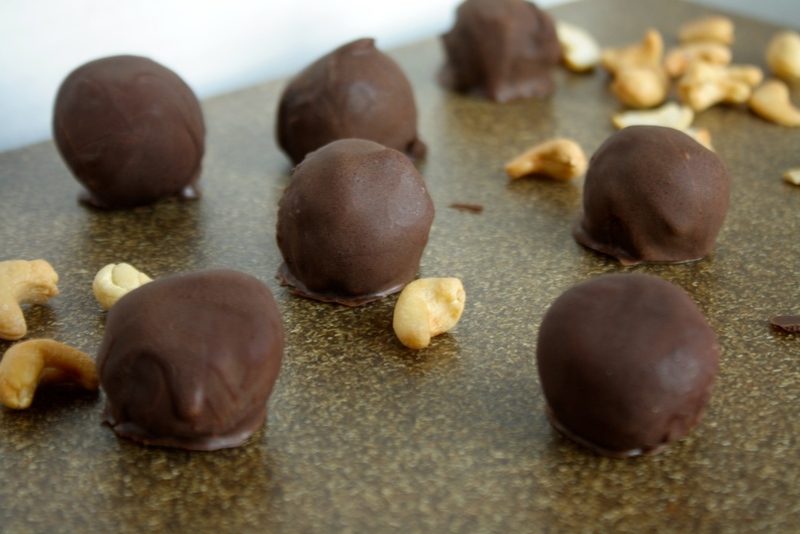 Remove truffles from the freezer and cover with chocolate. Repeat 2 times. Serve, enjoy!